Lefteris Pitarakis/APBank of America headquarters in London's Canary Wharf financial district. 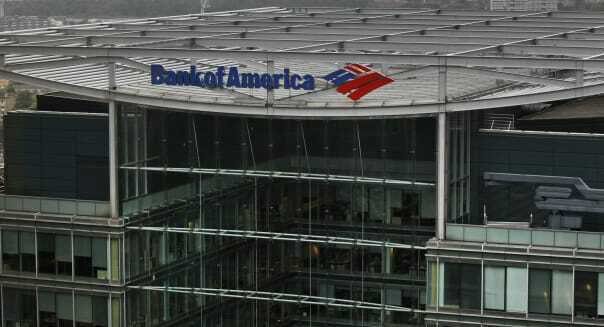 Bank of America (BAC) was caught having used its government-backed U.S. operations to finance overseas dividend arbitrage, according to The Wall Street Journal. Large hedge funds, mutual funds and other large investors use the complicated scheme to rake in dividends while avoiding foreign taxes. It's a legacy gift of the U.S. domestic tax system and collective expertise in bending rules to make a buck. But it raises the question of whether U.S. taxpayers -- and international relations -- could be put at risk if the trades necessary for the arbitrage go badly. The practice of dividend arbitrage has been around for decades. Countries typically impose a withholding tax on dividends paid by native companies to foreign shareholders. That amount typically runs 15 percent to 30 percent. "Because of the withholding tax, we found that people would avoid high dividend-paying stocks in foreign countries because they knew it would have a drag on their performance," Susan Christoffersen, an associate professor of finance at the University of Toronto's Rotman School of Finance, told DailyFinance. A hypothetical U.S. mutual fund, Taxwise International Fund, owns 100,000 shares of TransCanada Pipelines. TransCanada pays a 29 cents a share dividend to shareholders of record on June 30. Without arbitrage, Taxwise would receive $29,000 less 15 percent Canadian withholding for a total of $24,650. Taxwise lends its shares to a U.S. arbitrageur, which shorts the shares with dividend to a Canadian arbitrageur. The U.S. arbitrageur makes the market interest on the short sale. After the dividends are paid, the two arbitrageurs undertake a prearranged swap. The Canadian arbitrageur receives the market interest from the U.S. arbitrageur minus a discount, which the latter keeps. The U.S. arbitrageur receives the $24,650 plus any profit made on the difference between the purchase and sales prices of the shares. The U.S. arbitrageur returns the shares to Taxwise along with the $24,650 and a lending fee. According to the study, Taxwise would have likely given up about 5 percent of the dividends rather than the 15 percent that withholding would have required. The specifics and intricacies can vary, depending on the two countries involved. But because the arbitrage is a derivative that requires short selling and depends on market interest rates, it can potentially be risky. Dividend Arbitrage Began in the U.S. According to the Journal's report, Bank of America had begun to finance such deals through its U.S. unit -- Bank of America National Association, or BANA -- which also runs the company's domestic retail banking business. Effectively, Bank of America had exposed government-backed consumer deposits to possible risk should the trades run into problems. Dividend arbitrage originated in the U.S., according to a DailyFinance interview with Steven Rosenthal, a senior fellow at the Urban-Brookings Tax Policy Center. The practice was largely curtailed in 2010 after congressional hearings, as foreign investors were using derivatives to avoid 30 percent withholding. However, that didn't stop its use elsewhere. "Many other countries, including many European countries, have a tax framework similar to ours prior to 2010," Rosenthal said. Even if the mechanisms largely don't work for dividends paid by U.S. corporations to foreign investors, they are still available internationally. An Italian or American investor might use them to receive dividends from a German, for example. Bank of America told the Journal that BANA had not sustained any losses as a result of the activity and "no longer finances dividend-arbitrage activity." But were those any losses on an individual trade basis or net losses, which, if profitable enough, might hide individual losses? Also, according to the Journal, other parts of Bank of America outside the U.S. continue to offer such services. "I think the real problem here is derivatives are inherently complicated," Rosenthal said. "I think there are steps to make sure banks are exercising proper diligence and steps to take to carve out the risk from federally insured deposits." The Dodd-Frank Wall Street Reform and Consumer Protection Act had a section that forced U.S. banks to spin off work in certain types of speculative ventures, including some derivatives, into a separate entity. The structure would have prevented consumer deposits from potentially being affected by risky trades that went badly and, therefore, invoking government insurance of those deposits to make good losses. That section was revoked as part of the $1.1 trillion spending bill passed and signed into law last December. "I think Dodd-Frank did a good job," Rosenthal said. "But politically we haven't been able to hold the line and it's not clear where we're going to end up."